The software that we (and the vast majority of the 3d visualisation industry) use. A bunch of links to great websites where you will find a heap of tutorials and resources. A quick rundown on our workflow and the steps we take to create our imagery as well as some other important stuff you should know. We use linear workflow. For more information read this linear workflow explanation by Neil Blevins. And for a quick setup tutorial for 3ds max and vray here is a quick and easy tutorial by the same guy. Once you have all the software and plugins setup your going to need to learn how to use them. 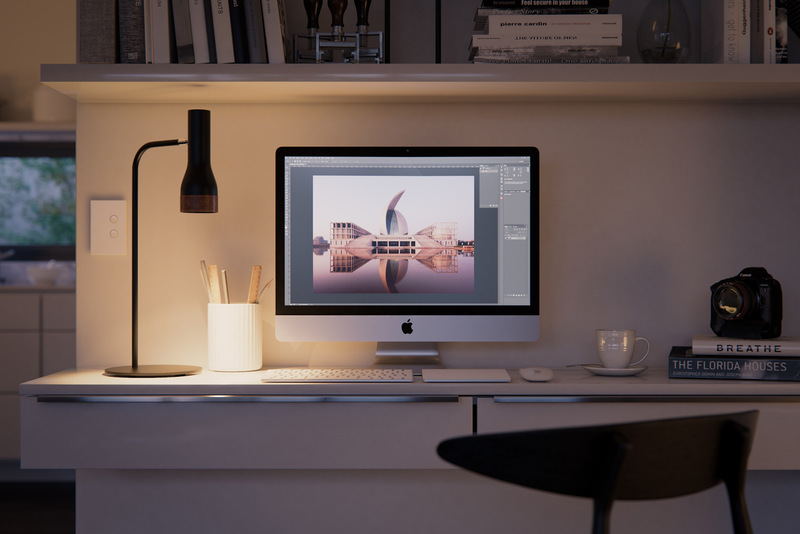 Luckily, max, vray and photoshop are the industry standards for architectural visualisation and there are a heap of free and paid tutorials online for them. You should start with learning how to 3d model properly. The fundamental element of all architectural visualisation is the geometry in your scene. It needs to be physically accurate and the polygons need to be clean. There are loads of free hard surface modelling tutorials out there. Mastering Hard Surface by Grant Warwick is considered one of the best. See below for one of his free lessons. For more complex objects like beds, sofas and plants, it is often more efficient to buy the 3d models rather than model them yourself. Especially if you are new to 3d modelling and your skills aren’t great yet… you might spend 3 days modelling a sofa when you could buy it online for about $8. But if you really enjoy 3d modelling then I would strongly encourage you to learn how to model everything yourself as this is an invaluable skill to master. We also often use the google 3d warehouse to get basic sketchup models which can then be re-modelled for better detail. And you can also try searching google images for ‘3d model chair’ or ‘3d model sofa’ etc etc and you will often find some good free 3d models you can download. Basically just search and ye shall find. Here is a little taster… this video is a little old but it gives you an idea of the level of detail he goes into with his shaders. If you found the above video interesting you should definitely watch Grant Warwicks Surface Imperfections Webinar. This is honestly one of the best vray shader tutorials you will ever find… amazing! Watch it. We have built up a huge library of textures over the years and the best resource for these is either a good old google image search (ie ‘wood floor texture’) or one of the many texture websites around such as textures.com. Recently we have been getting into scanned materials: Quixel Megascans, RDT, and Chaos Group VR Scans. These scannes materials are the future of CGI so best to get aquainted with them. We have also been playing around with Dabarti capture for getting highly detailed normal maps. For lighting the scenes we use a variety of different methods depending on the desired result. Lighting is very important so you’re going to want to have a really good understanding of how it works and how it affects your images. 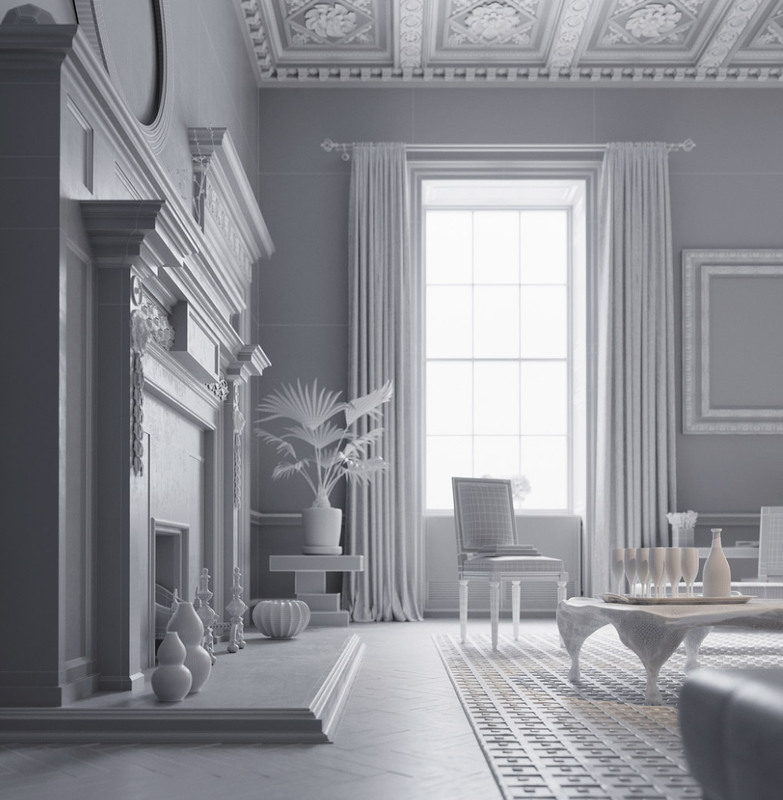 There is an abundance of ‘vray lighting tutorials’ on the web… just google it. There are also a heap of tutorials in the sites I have listed at the bottom of this page too. I’ve heard good things about the Learn Vray 5SRW course for beginners as well. They all have their plus and minus points. The most popular in the architecural visualisation industry by far are Vray and Corona. Most major studios where you might find a job in architectural visualisation will be using one of these 2 so it probably makes sense to learn one or both of them. We typically render our final production images at 5k (5000px wide) and save them as .exr images which we then import into photoshop for post production. Which leads me to my next topic..
For still images we generally use photoshop and for animation we use after effects. In photoshop we use a couple of plugins called Arion FX and Camera Raw for some subtle effects when required. But generally we like to get as best a result possible directly out of vray and leave the post work to subtle colour grading and basic adjustments (contrast, curves etc). For things like depth of field and lens flare effects its also good to use a plugin – try frischluft and optical flares. But nowdays you can get some pretty decent results for both dof and lens flare straight out of vray. There are a million things you can do to achieve just about anything in post production so it really does depend on what you are trying to achieve with your image. Step 1. Reference Images and planning. For most projects we like to start by gathering some reference images of the type of style, look and feel we are going for in the image. We often scan design websites like archdaily for some inspiration. And then we plan out how we are going to approach the project to get the result we are looking for. Step 3. Add basic lighting, cameras and textures. Setup your lighting (daytime, night, twilight, interior etc etc) and get some rough textures on your model. You’ll need to tweak both textures and lighting later so don’t spend too much time on it now… just get it looking ok. Add your camera and work on a rough composition (you should do a few tutorials on image composition and try and learn how the great photographers compose their images). Step 5. Tweak everything. Once you have all the objects and the rough outline of your image its time to start tweaking everything (composition, lighting, textures, styling). Step 6. Render out the hi resolution image. Once your happy with your scene and test renders you can go ahead and render out the final image as a 5k 32bit exr. Step 7. Post production. Import the exr into photoshop and adjust until you get the desired look. Done. Then sit back and admire your work. If you really love what you do you’ll actually enjoy spending hours watching tutorials and working on your images. At ScreenAge we look for people who are really passionate about 3d visualisation and CGI and love what they do. And the more time you spend at it the better you will get. It takes years of practice to be able to produce really high quality imagery so don’t get too bummed if your images don’t look amazing straight away. There are so many tutorials, making of’s, tips and workflows on these sites that you should be able to find pretty much everything you need to know about architectural visualisation there. I encourage anyone who is really keen and passionate about archviz to get involved with these sites… read as much as you can and learn from all the great people who have got some amazing wisdom to share. And start practicing! Create some personal projects. Find a real life archviz photo that you really love and try to replicate it. Vray and most other render engines are setup to replicate real life. Therefore it is critical that you set up your scenes using real world settings. Cameras – approach a cgi scene the same way as a real life photographer would approach a scene. The camera settings (Fstop, IS0, Shutter Speed) should all be the same as they would for the equivalent scene in real life. Lights – set the valules of your cgi lights to real world values. Set the colour temperature in kelvins and the power/intensity in Lumens. Learn what real light bulb settings are and use them. Scale – make sure you model everything and set your texture scales to accurate sizes. Its always best to run a tight ship when it comes to scene organisation. Especially if you will be working as part of a team. Layers – use your layers religiously! And always keep them well organised. Having your scene split up into well thought out layers will help you in numerous ways when it comes to manipulating and navigating around your scene. Naming – its a great idea to get into the habit of naming objects in your scene. Especially things like lights and cameras. And be specific…. give every different light an obvious name like ‘ kitchen downlights’ or ‘living room lamp’. And if you have multiple cameras in you scene its a good ideas to give them descriptive names as well ie ‘kitchen mixer close up cam’ or ‘bedroom angle 01’. So I hope all the info above is helpful and will at least point a few people in the right direction.